We are at the beginning of a data revolution, and the way businesses make sales and investment decisions are set to fundamentally change. At Mattermark, we’ve organized a massive amount of data on the world’s fastest growing private companies. Starting today, companies can tap into our data to build proprietary solutions that can surface valuable insights. 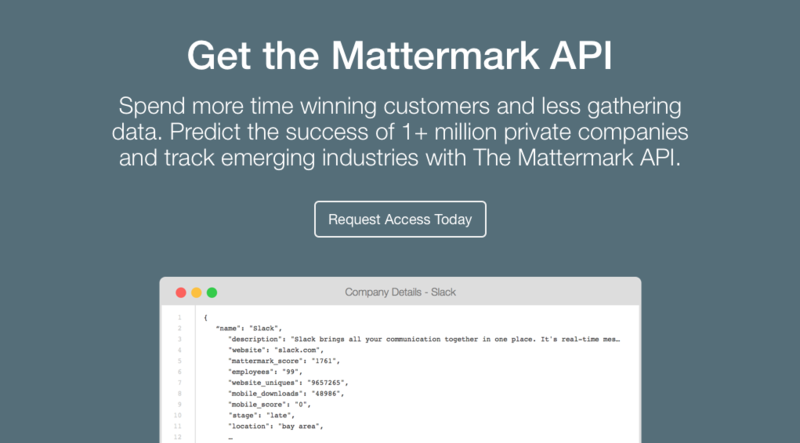 Mattermark Webinar: Join our webinar on Tue, Jun 16, 2015 10:00 AM – 11:00 AM PDT. Kyle Porter, CEO of Salesloft, will be sharing his thoughts on why sales teams have adopted a more data driven approach to prospecting in recent years. Submit content for us to consider with this online form.